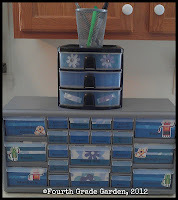 This week, for Tara's Monday Made It, I am posting pics of some of my plastic drawer storage that I recently spruced up. First off, I have my lovely toolbox. My inspiration came from the hundreds of other toolboxes that have been floating around over the last few weeks. I think the first one I saw was from Create Teach Share. Trying to stick with my robot theme I added a head on top along with a pencil holder. Ok, so it doesn't really look like a robot. You'll have to squint to see it. Look for the eyes and the smiley face. 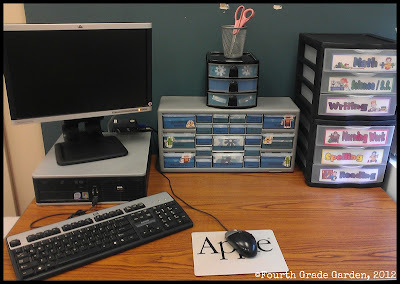 I use the plastic drawers from Walmart to store papers and handouts. 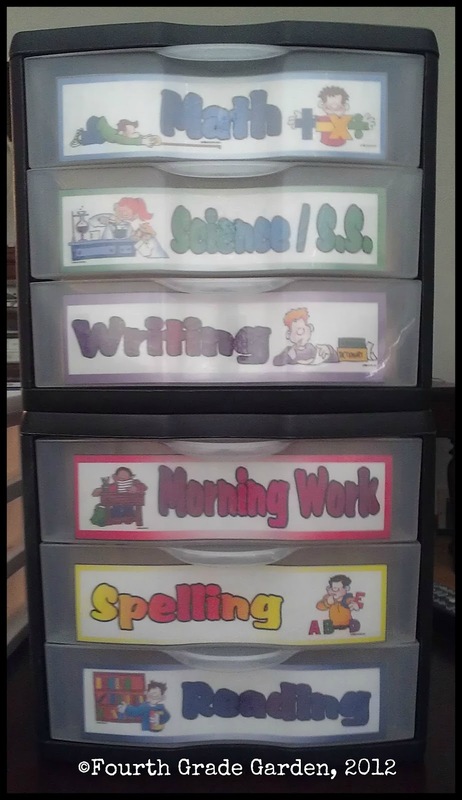 One is used for our reading center materials for the week and the other two are used for my handouts for the week, organized by subject. You can download some of these labels here and here. 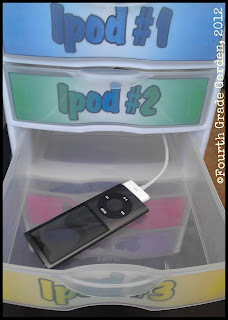 I have 5 iPods that we use in our classroom. I house them in a 5-drawer plastic bin. Each drawer contains one iPod. I number them and assign students a specific number iPod. 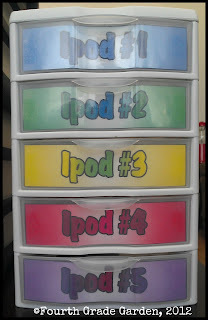 This helps me hold students accountable for how they handle the iPods. 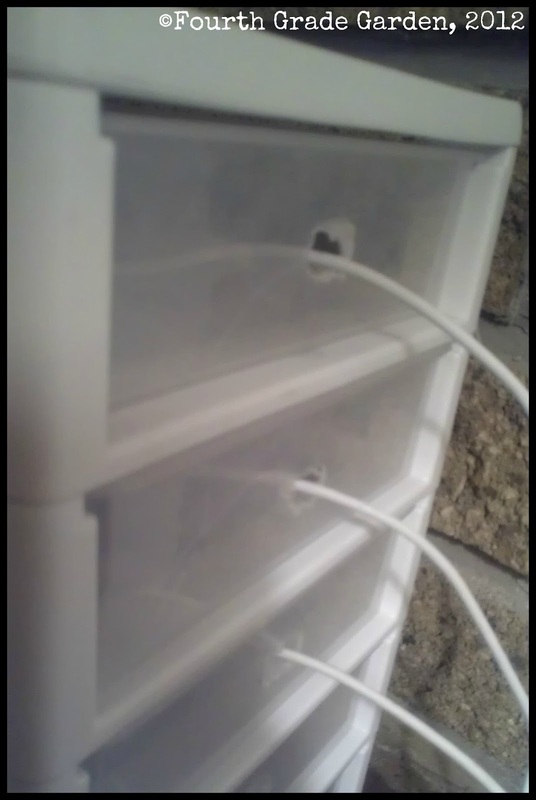 My husband drilled a hole in the back of each drawer so that I could run the wires through to easily charge them. My school provided me with a super cool charger that plugs into the wall and can charge up to 4 iPods at a time. When students place their iPod back into the drawer, they hook it up to charge. I know I know...4 iPods can charge at once, but I have 5. 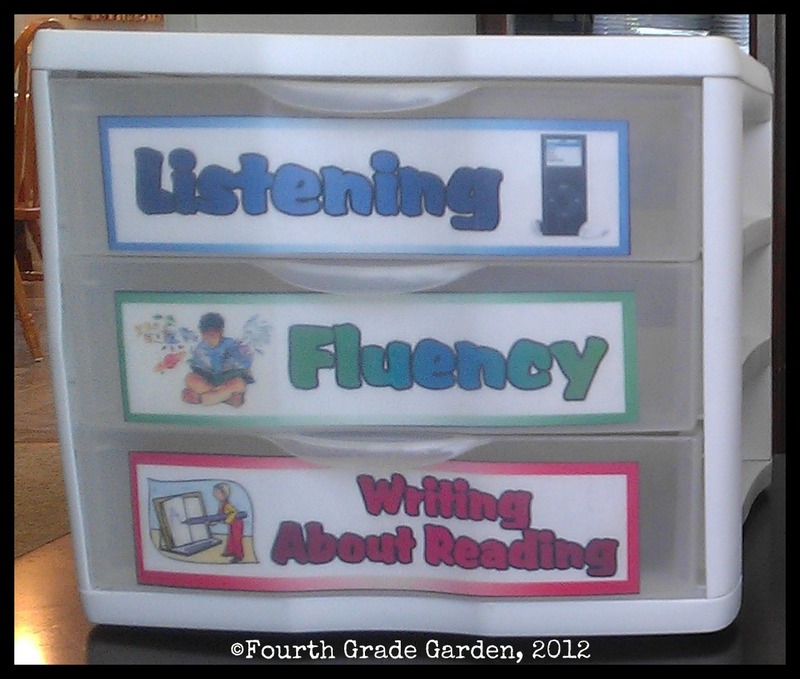 I usually have around 20 students in class and I divide them into 5 groups of 4 for reading centers. Therefore, I usually do not have to assign anyone the 5th iPod. It sits as a back up in case we have trouble with one of the first four or it is used for other things. However, to charge it, I just rotate it through the other drawers at night and place it back in the correct drawer in the morning. I typically only have to do this once a week since it is used less often. 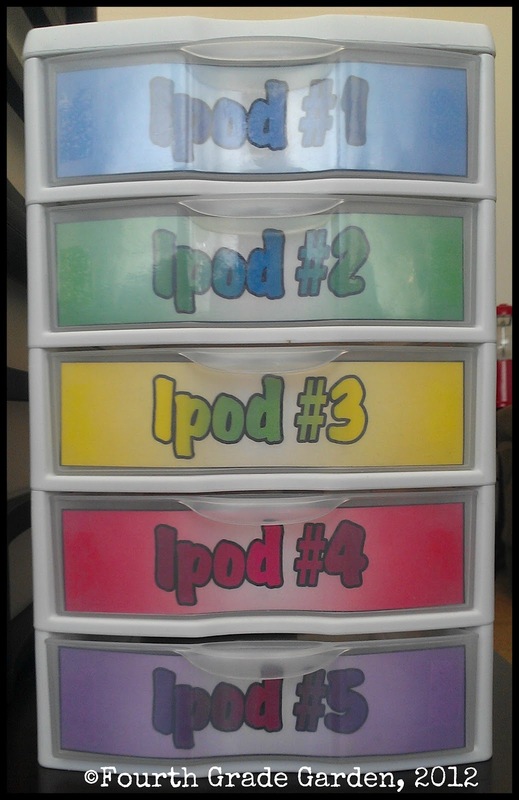 You can download my iPod labels here. 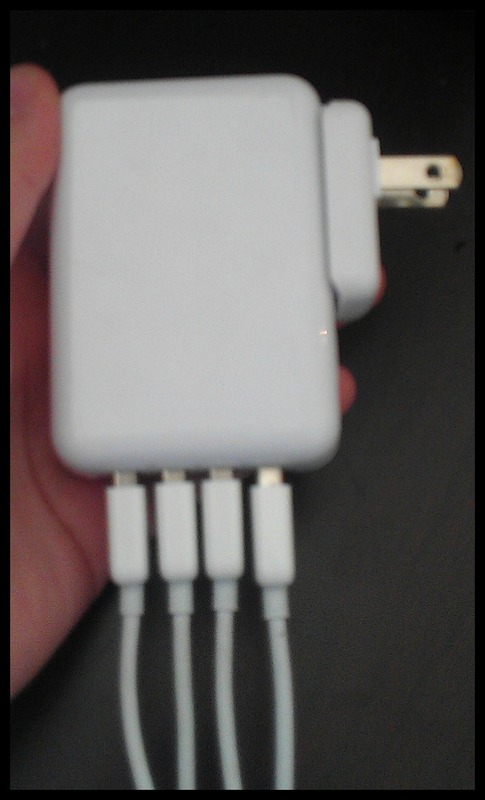 I'd love to find a charger for my iPods that plugs into the wall and can charge all 5 at once. If you happen to know where one is please let me know. 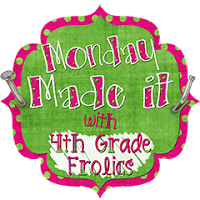 Link up with Tara for Monday Made It and check out all the super cool things everyone made this week. Thanks for all the great compliments! 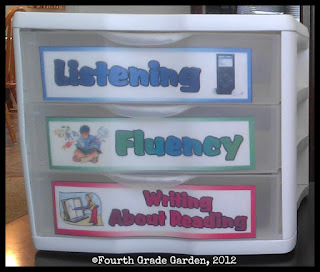 Here is a copy of a cursive label that you can add to your plastic storage bins (if you are making one). I received the iPod charger from my school about 2 years ago. I looked it up online and you can still buy one. You can purchase one at Amazon. It is on sale for $9.99. Not a bad deal for the convenience it brings. Your labels are really pretty! I love it. I love, love, love your ipod setup! Very cool idea!!! What a great idea about the ipod cords and storage. Love it! 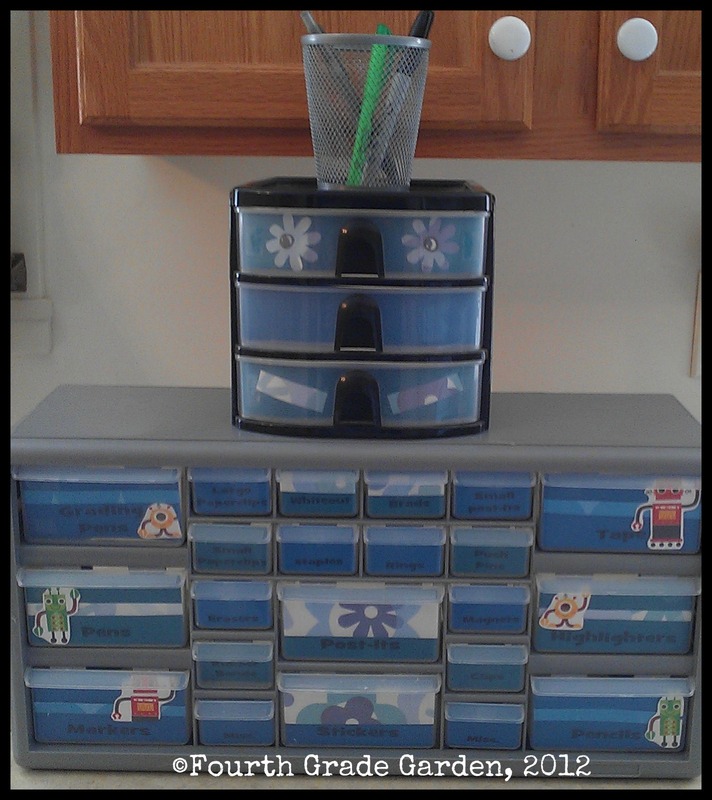 I love your cute robot toolbox! And the charging station is a great idea! Cute and functional. Thanks for sharing. Would love for you to stop by my blog sometime! love your labels! 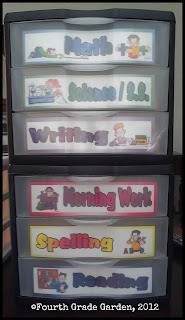 i use those bins for my papers too, just snatched up the labels. thanks! Anyway you could make a Cursive label for me? I teach 3rd grade, and Cursive is big for us. I love these labels! I will have to use these to spruce up my own containers! Thanks for sharing! The i-pod holder is so cool! I am sure it is nice not to have the cords get all tangled. I am your newest follower. I would love to have you come by and visit. Oh my gosh! You are so organized! I'm trying really hard this year to get organized & stay that way! Thanks for sharing! I love the pic of your desk! Great labels!! I too love the charger!! What a cool charger!! Just found you through the linky and am your newest follower. Come join my linky party! This is such a fun project and so creative. Thanks for sharing. I love the iPod storage as well. I can't wait to get to started on it. Do you happen to know the brand of the charger your school got you? Thanks for your help. 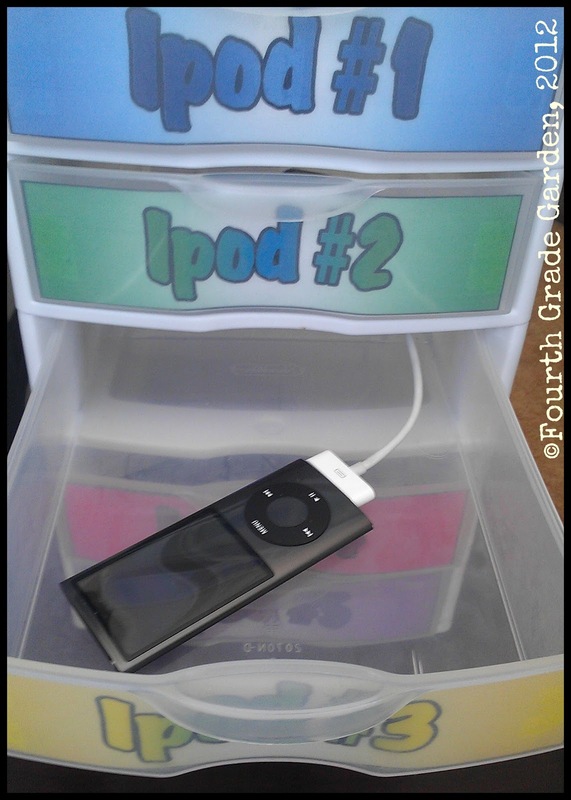 I love that idea for storing ipods - may even have to use it at home it seems like my boys have a hard time keeping track of theirs. I am following from Wild About Teaching. I love your storage for your iPods! I have iPads and I'm thinking your system might work for me too! I use that when I need extra USB ports for things just like this. I love your charger set-up. It's brilliant! Your labels are pretty too. LOVE LOVE LOVE LOVE LOVE the iPod idea!!!!!!! I love the idea, you know all the people will stop to your page and check what you have done regarding your gadgets. They are very organized. Super great and CUTE storage ideas! I adore the creativity of the students. The design were done perfectly and matches the type of the school. it's pricey, shop around you might find a good price on ebay. it charges 5 at a time. I'm thinking you could remove the 'dividers', then put it behind or under the drawer set.